Kingsglaive Final Fantasy and Warcraft are in a battle over which is the best ‘movie based on a computer game’. That’s another way of saying that Kingsglaive looks great, is entirely loyal to the franchise, takes itself very seriously, nearly works but is missing something. In the computer game Final Fantasy XV we follow Prince Noctis as he battles against the machine empire of Niflheim. The movie overlaps, telling a similar story but through the eyes of his father King Regis and the Kingsglaive royal guard who enjoy magical powers that come with his blessing. There’s no doubt that Kingsglaive is stunning. At times you might forget your watching an animation. You’ve probably had this in cut-scenes in the latest computer games; they look great. Kingsglaive is a movie length cut-scene. In particular the spotlight falls of Nyx (voiced by Aaron Paul), one of the Kingsglaive as he is assigned to protect the Princess Lunafreya (voice by Lena Headey) of Tenebrae. He’s introduced in a giant battle as the Kingsglaive battle against the insectoid robots of Niflheim. It’s a great scene; you meet a host of characters, under the magic of the Kingsglaive, taste the ferocity of war and get to meet some of the monsters you’ll fight if play the game. It’s worth keeping in mind that Sony have two goals with Kingsglaive – Final Fantasy. They’ve spent so much money on the motion picture that they must want – need – it to be successful on its own two legs. They’re also hoping to whisk up interest in the franchise. Knowledge of the Final Fantasy game series does help enjoy the movie. You don’t need to know one thing about Final Fantasy XV, in fact the movie works as a way to introduce that particular world, but if you know the franchise then you’ll be used to people with swords fighting in a world with racing cars, airships, monsters and magic. It’s this mashup of magic and technology that is both Kingsglaive’s charm and weakness. It can be surreal at time. For example, a huge squid monster is found lurking in the most unlikely of places at a key moment in the film. That’s a little hard to cope with if you thought you were watching a gritty sci-fi. On the other hand, the cityscape is gorgeous and the pay off when the magic levels start to rise is well worth it. There are some quirks that might bring the animation down a notch for some viewers. Audi is a sponsor. It’s declared in the credits but you’ll tell by being able to watch – Audi adverts appearing in the city and scenes with a lingering focus on slick Audi cars. I noticed Beats as another sponsor. Kinda weird tagging these contemporary logos in such an alternative reality. There’s also only so much the animators can do to sync lips of the animation to the dialogue. I suspect we flirt with entering the Uncanny Valley of likeness when it comes to the syncing given how real the CGI looks at time. I enjoyed Kingsglaive. I’m not going to watch it again and of all the gifts I might buy friends for Christmas this isn’t likely to be one but I am more interested in the game now. The movie was so close to being something special but it falls short. Just. If you’re a fan then, yes, definitely give the movie a chance. 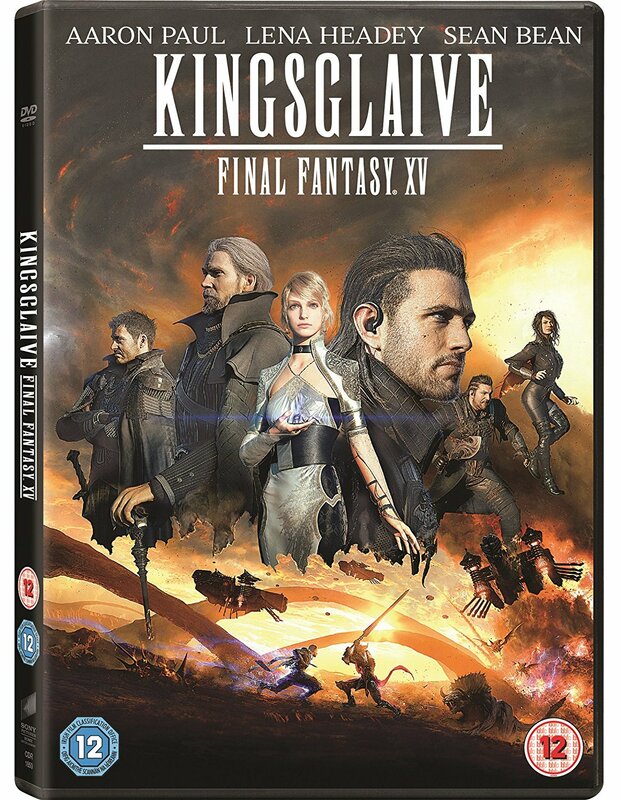 You can buy Kingsglaive: Final Fantasy from Amazon.